Plants can benefit your health – and it isn’t just possible when they are rooted outside. Bringing plants indoors can actually improve the quality and health of the air that surrounds us. They carry both practical and aesthetic benefits when planning an indoor plantscape. Plants clean the air through the process of photosynthesis. As humans breathe in oxygen and breathe out carbon dioxide, plants do the opposite. They absorb light, carbon dioxide, and water to manufacture sugar. This chemical process creates oxygen as a byproduct. Regardless of how advanced an air filtration system in a home or office might be, none have the ability to create oxygen. Oxygen is a vital element of clean and healthy air. 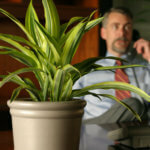 Indoor plants may be the answer to enhancing our exposure to it. At Planterra, we take this into consideration when planning an indoor plantscape. Indoor plants are often comprised of species native to the rainforest floor – those areas that experience fewer breezes and less light. Plants that naturally photosynthesize in lower light are an ideal fit for indoor plantscapes. In addition, it’s important to note that plants manufacture phytochemicals. These naturally-occurring chemicals are used to protect the plant from insect, diseases, and microbes that could threaten it. That’s also a benefit to those of us who live or work surrounded by indoor plants. Phytoremediation is the process of any plant that has the ability to mitigate pollutants in the air, soil or water. That’s reason enough to surround ourselves with a few healthy plants indoors. How do plants purify the air? Indoor plants accelerate the process of transpiration process in which phytochemicals and water vapor are emitted to create air movement. In transpiration, plants circulate air and can pull airborne toxins into their leaves and roots. When pollutants in the air are absorbed through these microscopic openings in leaves, the process is called stomata. Studies from NASA indicate that plant-filled rooms contain 50 to 60 percent fewer airborne molds and bacterias than rooms without plants. And a cleaner environment is just the start. When considering what plants to add, which species will thrive, and how to care for them, Planterra experts can help. Ask us how to improve the quality of the air around you.